While I’m not a huge sports fan, I am a huge fan of any excuse to get together with friends & family. Especially when that means there is tons of food involved, which is pretty much every occasion! 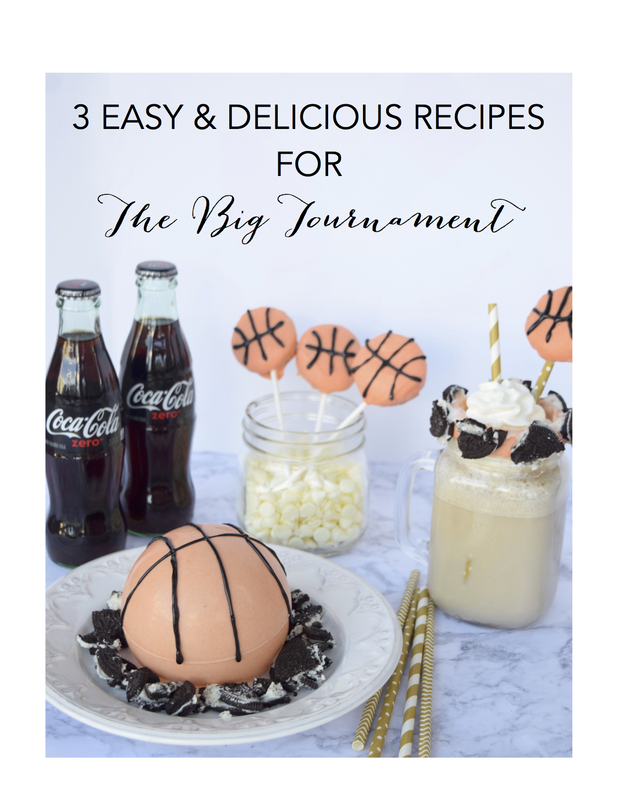 So since it’s The Big Tournament season which means lots of get togethers & celebrations, I wanted to make really fun & creative recipes (duh!). As always, I wanted them to be simple enough for anyone to recreate. Over the top milkshakes instantly came to mind as they’ve been practically taking over my Instagram feed lately–no complaints on that one! They seemed like the perfect refreshing drink to serve to a bunch of screaming fans! 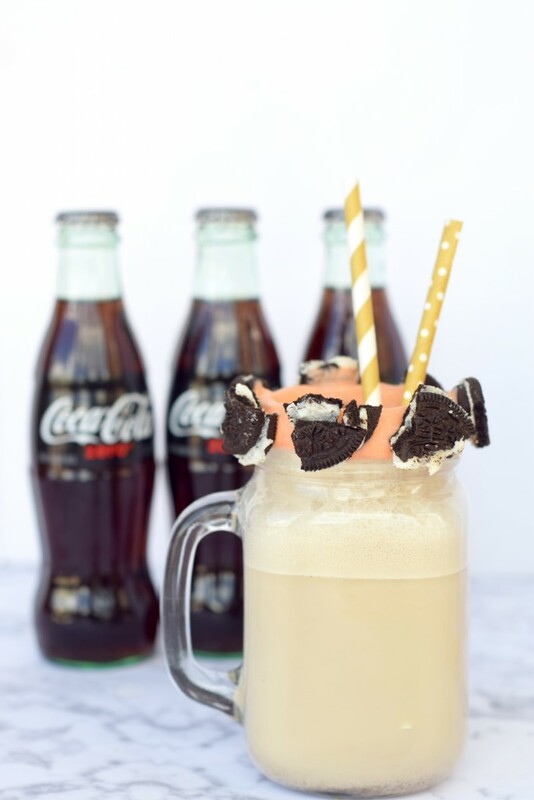 Since Mondelēz International and Coca-Cola are Corporate Champion and Partners of the NCAA, I used Coca-Cola Zero™ mixed with some vanilla bean ice cream to create an ice cream float. 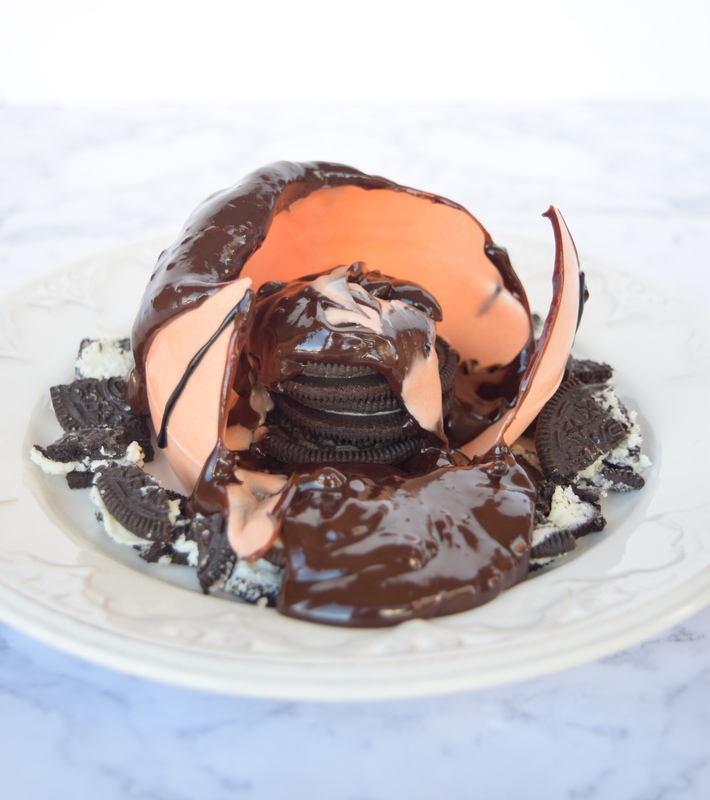 The next dessert I thought would be impossible to make. 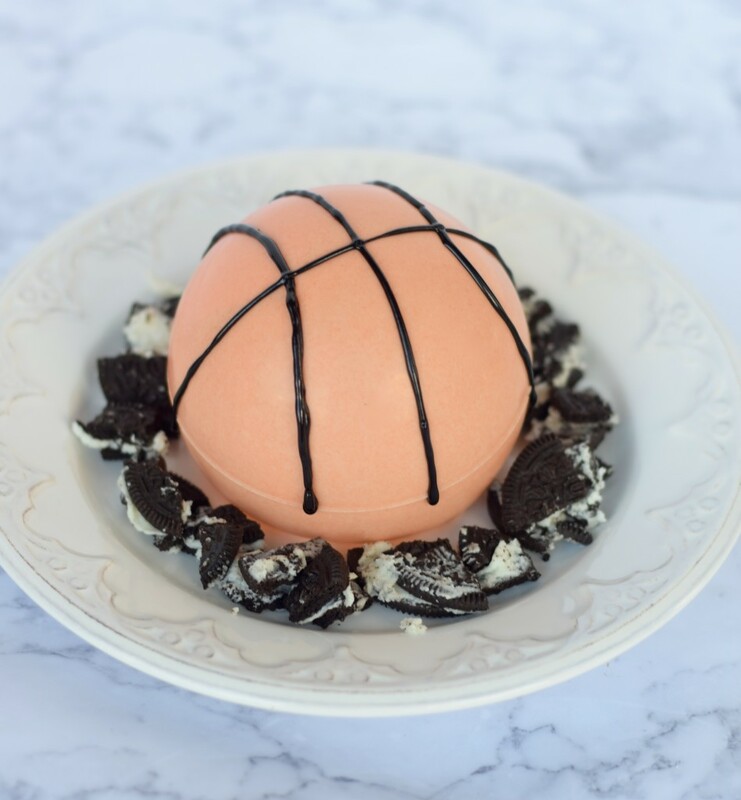 The magical chocolate ball, which has been featured at many hot spot restaurants, turned out to be super easy to create. Plus, it didn’t hurt that they look just like a basketball helping to keep on theme. 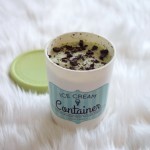 I filled it with leftover OREO’s from the last dessert I made which were OREO pops. 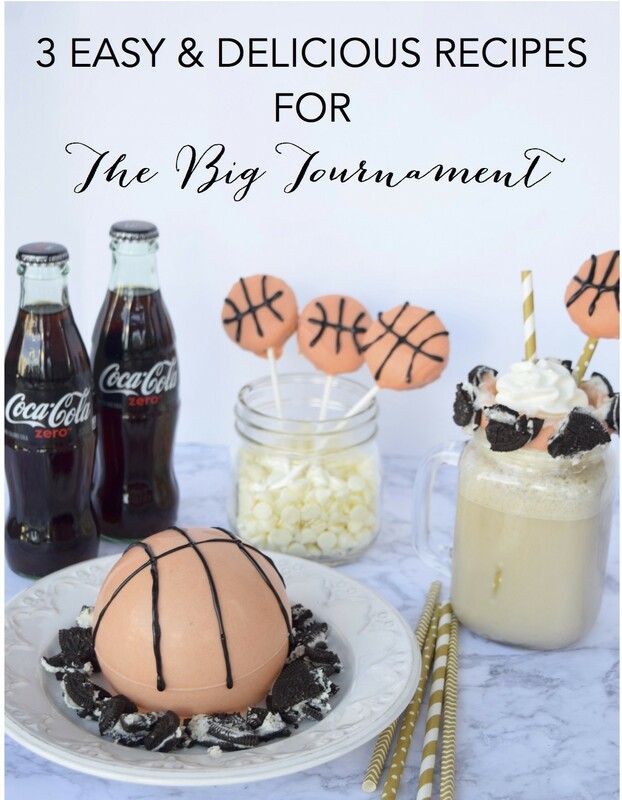 These also were easy to create to look like a basketball & they also made great favors as guests parted. 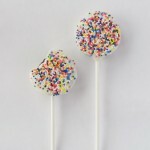 After all, sweet treats are ideal whether you’re celebrating a victory or sulking in defeat. All three of these treats only took about 45 minutes to create which in my book is an automatic win! 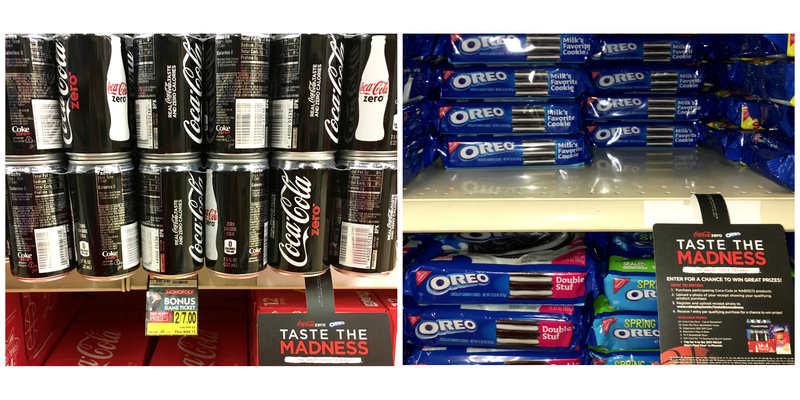 I snagged all the ingredients I needed at Jewel-Osco but you’ll be able to find all OREO (cookie aisle) & Coca-Cola Zero™ (beverage aisle) ingredients at Albertsons, Safeway, or one of their banner stores: Carrs, Acme, Shaws, Star Market, Randalls, Tom Thumb, Vons, Pavilions, United, Market Street. In blender, combine ice cream & Coca-Cola Zero™. Blend until smooth. Set aside. In microwavable safe mixing bowl, melt the white chocolate for 30 second increments until smooth, stirring in between. Add in desired amount of food coloring & stir to combine. Dip the tops of each jar into the chocolate. Immediately top with crushed OREO's. Place in fridge for 5 minutes. 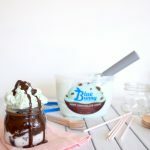 Pour float mixture equally into mason jars. Garnish with whipped cream, serve, & enjoy! In microwavable safe mixing bowl, melt chocolate chips for 30 second increments until smooth. Add in desired amount of food coloring & stir to combine. Divide the chocolate evenly into each ornament. Close ornaments & shake until entire surface is covered. Freeze for 30 mins. Set 3 solid OREO's directly in the center of your serving plate. Once ornament is ready, carefully open & remove solid chocolate ball. Warm a microwavable safe bowl for 1 minute. Carefully rub the bottom of the ball on the bottom of the bowl until a hole opens up. Continue until hole is big enough to fit OREO's. 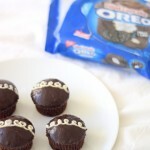 Place chocolate ball over OREO's & decorate with more crushed OREO's around it. 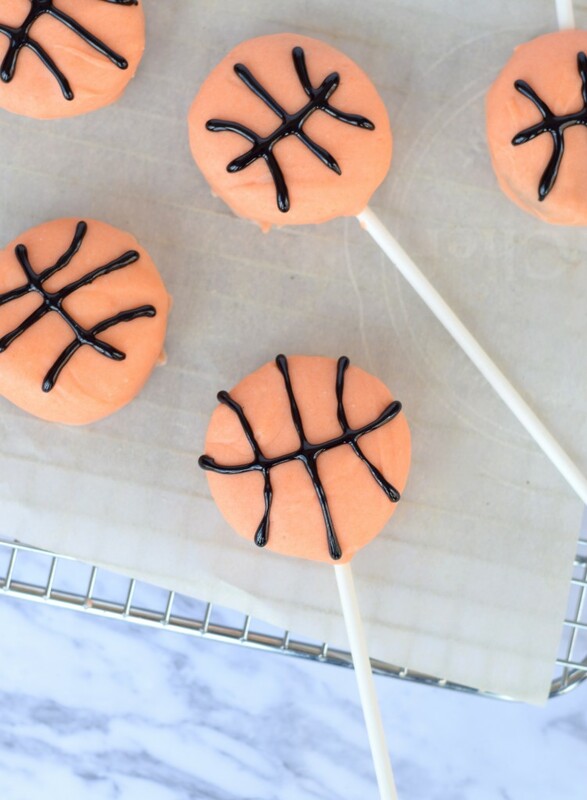 Use icing to create the basketball effect. Serve & enjoy! In microwavable safe mixing bowl, melt white chocolate for 30 second increments until smooth, stirring in between. Add in desired amount of food coloring & stir to combine. Line baking tray with parchment paper, Open each OREO & dip ends of sticks in chocolate. 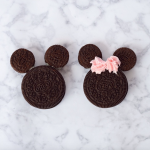 Place chocolate covered stick tip inside each OREO & firmly close them with stick in between. Reheat chocolate if necessary & dip OREO in chocolate until fully covered. Place in fridge for 10 minutes. Decorate with black icing writer, serve, & enjoy! Everything look divine! My mouth is literally watering from looking at that Chocolate Ball dessert. 🙂 Thanks for sharing these amazing recipes! This looks absolutely amazing! I need to try this recipe 🙂 Thanks for sharing..